320 pages | 89 B/W Illus. The amount of data in everyday life has been exploding. This data increase has been especially significant in scientific fields, where substantial amounts of data must be captured, communicated, aggregated, stored, and analyzed. Cloud Computing with e-Science Applications explains how cloud computing can improve data management in data-heavy fields such as bioinformatics, earth science, and computer science. Featuring significant contributions from research centers, universities, and industries worldwide, Cloud Computing with e-Science Applications presents innovative cloud migration methodologies applicable to a variety of fields where large data sets are produced. The book provides the scientific community with an essential reference for moving applications to the cloud. "I found the material presented in Chapter 11 (titled SaaS Clouds Supporting Biology and Medicine) to be highly enlightening and informative. The discussion on high performance computing in the context of cloud computing with applications in computational biology and medicine is very educational. There are a number of research problems in biology and medicine that demand access to large and federated data sets. The discussion in this chapter provides a means for understanding the cases and situations in which the cloud can be utilized for such important purposes." 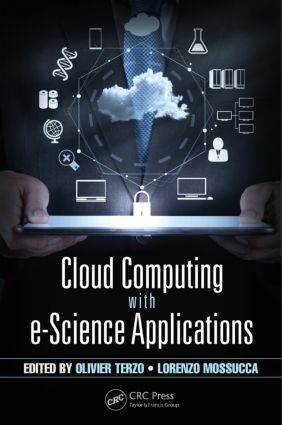 " … the book shows many advantages and the power of cloud computing in solving e-science applications, as compared to other types of high performance computing infrastructures. The selection of e-science applications included in the book comprise representative problems from bio-science, health, data processing, workflows arising in bussinesses, etc. … well-written and easy to read not only for specialist but also people with basic knowledge on cloud computing." Olivier Terzo holds a bachelor’s degree from the University Institute of Nancy, France, and an M.Sc and Ph.D from the Polytechnic of Turin, Italy. Dr. Terzo is senior researcher and head of the Research Area: Advanced Computing and Electromagnetics (ACE) at the Istituto Superiore Mario Boella (ISMB), Turin, Italy. Previously at ISMB, he served as researcher in the e-security laboratory and as head of the Research Unit Infrastructures and Systems for Advanced Computing (IS4AC). His current research focuses on application integration in cloud environments. He has published more than 60 papers in conference proceedings and journals, and as book chapters. Lorenzo Mossucca studied computer engineering at the Polytechnic of Turin. Since 2007, Dr. Mossucca has worked as a researcher at the ISMB in IS4AC. His current research interests include studies of distributed databases, distributed infrastructures, and grid and cloud computing. For the past few years, he has focused his research on the migration of scientific applications to the cloud, particularly in bioinformatics and earth sciences. He has published more than 30 papers in conference proceedings, journals, and posters, and as book chapters. He is part of the IEEE Technical Program Committee and is a reviewer for many international conferences.